If you need assistance with recovering your business website from a Panda 4.0 penalty please contact Len Raleigh at contact@telapost.com or Jesse Wojdylo at jwojdylo@gmail.com. 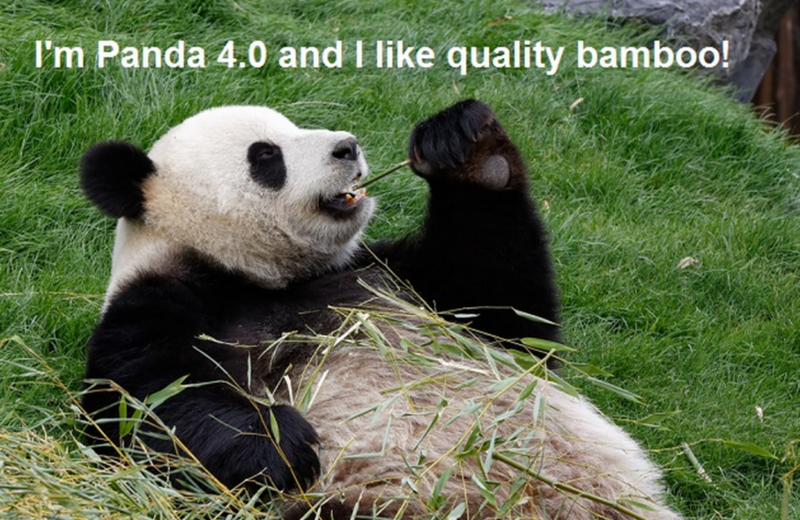 What is Panda and Panda 4.0? How big is the Panda 4.0 Update? How do you recover from a Panda 4.0 penalty? How do I create Panda friendly content? Do you need help recovering from Panda 4.0? Panda is a quality algorithm released in 2011 which is designed to reward sites with high quality content, and bring down sites with low quality content. Affected sites with low quality content will receive a noticeable reduction in traffic. Panda 4.0 has been given the “4.0” designation which tells us that it is a more significant update that the most recent Panda updates. Matt Cutts just announced the update on Twitter a few hours ago. It will be days or even weeks before we can thoroughly grasp the full affects of the Panda 4.0 update. If you are a business owner and log in to your Google Analytics accounts next week and are seeing a drastic reduction in traffic starting around May 20, 2014 or shortly thereafter then you have been hit with Panda 4.0. Backlinks and onsite/technical SEO aside, ranking in Google search today is not that much different than it was a decade ago, especially for competitive niches. Anyone telling you otherwise is probably not ranking in search themselves. Unique and quality content always wins in the long run. I have personally generated several million dollars in sales via ranking content in search and people that haven’t experienced this have a difficult time comprehending the value of content. Back in the pre-WWW days people visited online services for what they offered or visited online services for a specific reason. These days Google is attempting to weed through mountains of spam, scraper sites and spun articles to deliver relevant search results and quality content to its users via algorithms. Will user input one day affect search? It will have to. But right now consistently generating quality content for your website is what it takes to rank in search and is what it will take to recover from a Panda 4.0 penalty. Sites hit by Panda 4.0 will have no warning in their Webmaster tools account as this is an algorithm change. Some websites will need to start blogging and adding consistent and quality content to their site. Others will need to completely scrap their site and start a new one- that is harsh news but necessary in many cases as algorithm updates usually affect entire domains. Recovering from a Panda update is simple. Your new website should be a WordPress site using a responsive theme and you need to be putting out quality content on your blog on a regular basis. Site owners can rest assured their websites are safe and even look forward to future algorithm changes. Instead of focusing on one keyword, it is best to create content that is natural. Some of the most high profile LA and California accident lawyers have slowly started to figure this out as they are spending time creating long tail content for their WordPress websites. Your content should always be geared towards informing your audience. When I am creating content for my clients I pretend Google doesn’t exist. Every personal injury attorney has a page on car accidents, and every optometrist has a page on eye exams. My slogan is to “take your content one step further”. Traditional SEO companies want to optimize your car accident page and charge you a huge recurring fee. Content writers and real SEOs do not concentrate on one page about car accidents- they elaborate and discuss the value of your left hand, how getting rear ended by a truck is negligence, how a Toyota Prius holds up against a big rig and how long a lawsuit takes to complete. This type of content can be created for anyone including cake designers, plumbers, wardrobe consultants, IT professionals, funeral directors, etc, you name it. Pandas are cute animals that want lots of quality bamboo, just feed the Panda. Here is a great article on why a copywriter is worth the investment. My best clients have come to me via word of mouth. Most of them have been burned by an “SEO firm”. Fortunately, I do not have to go around beating on doors and harassing business owners with ridiculous, misleading or deceptive sales pitches and I sleep quite well at night knowing that I’m providing an outstanding return on investment. I owned a brick and mortar business for 12 years which was successful due to its content and I have also experienced the benefits of ranking in search since the days of Excite and AltaVista. I am easily able to assist business owners with their SEO and content creation needs. Some of the best content creators out there are business owners that are experts in their niche, however, for 95% of them they are better off hiring someone that specializes in ranking in search and creating high quality content that is not penalized by Google updates, but is rewarded by them. If you need this type of assistance be sure to visit my page on copywriting and content creation to see how content can help your business. Ok, it has been 5 weeks since Panda 4.0 rolled out. What have we learned? Some websites lost a lot of traffic. Some websites saw significant increases in traffic. It appears that sites that lost traffic can clean up their act and recover without too much trouble.Remember, this is an algorithm change, not a manual penalty. Maybe it was Panda, or maybe it was just time for it to take off, but as of May 26 they started appearing all over the place in Google search and their numbers will only go up from here. I personally look forward to more Panda updates as I create content for users, not for search engines. Writing consistently about a specific topic leads to more exposure and increased rankings in search. Are More Panda Updates Going to Hit Press Release Websites? What Industries Will Get Hit By Algorithm Changes? Time and again I hear SEO agencies and companies claim they can magically help a website rank on the front page of Google with some “behind the scenes” work. In essence, what this tells me is they are going to charge an arm and a leg for something that a business will not be able to track. I have heard of SEO companies charging $20 to simply install a single plugin on a WordPress website. This is a click of the mouse. Nothing more, nothing less. If you want your business website to truly rank for an assortment of keywords, especially competitive keywords, there are no magic tricks. It takes great content that is consumable by a visitor. If a visitor comes to a website and has no desire to purchase a product or service from that business they are going to “bounce” immediately and go right back to the Google search. This tells Google that particular website is not valuable to its users. Having a high bounce rate and a low time on site is terrible for SEO, but even more importantly, it shows that website visitors are not getting what they desire. Any SEO agency or company that does not clearly show Google Analytics or other analytical programs illustrating bounce rate and time on site should not be employed or entertained. One of the best ways to reduce bounce rate and increase time on site is to provide valuable content that has depth. Some of the best articles or resources I have consumed are well over 5000 words with YouTube videos, photos and links to other websites that I found useful. If an SEO company is producing a single blog post a week, or even a month, there is a strong likelihood that you are not getting the optimal amount of search traffic. When looking to learn more about a competitive industry as it relates to ranking in search use our Plastic Surgeon SEO and Social Media Services page. With the Google Panda 4.0 algorithm update we have heard, once again, that low quality content is being pushed lower in the Google search rankings. This is going to continue to happen with every Google update in the near future. If your business website is covered with resources that are shallow in content and do not provide the user with information you can expect to see a drop in search visitors in the near future. If you have found that your SEO firm, agency or company does not have answers as to why your search rankings are dropping it might be time to adjust your business strategy and hire someone that is willing to help produce in depth content as well as provide the basic on site SEO services. The frequency of content being published to any website is extremely important. If you go for weeks or months without publishing new content to a website there is a chance that Google will not rank that website well. It basically tells Google that you have no knew things happening in your business. If a business sits vacant for months why would anyone want to visit? The same is true when it comes to a website. If you are unwilling to publish any new content to a website you are telling visitors there is no reason to visit and check out what is new. It is sometimes very difficult for business owners to produce quality content on a daily or weekly basis. Some business owners simply do not have the time as they are needed elsewhere. They are needed on the sales floor or at board meetings. There are bigger decisions that can only be made by executives. For this reason, it is not a bad idea to hire a content writer. Remember that you get what you pay for. If you go to Text Broker or Fiverr and hire a cheap content writer you are likely going to get shallow content that does not rank well in Google search. A content writer is well worth an investment in both money and time. Pay a premium for the most high quality writers and you will reap the benefits over the course of the lifetime of your business website. There are many SEO companies, firms and agencies that will claim that you need meta descriptions, title tags and tons of links back to a website. While there is some value in these tasks content will always be king in the eyes of Google. All things being considered, a website with more content will always outrank a website with less content. It is important to understand that more content does not mean the same 300 word blog post written over and over in a different way. If you do that you may end up getting hit with a penalty for thin and useless content. There are many ways to produce amazing content. One way to do so is to utilize the many Google products that are free. Google Plus allows users to create their own YouTube Channel through Hangouts on Air. By producing video content you are giving your website visitors something to watch and consume. If you want to take it a step further, you can transcribe that content so it is not only a video but written content as well. This is killing two birds with one stone. If you have the desire to create videos and have them transcribed please feel free to reach out to me at jwojdylo@gmail.com as this is something I have done for many clients. Another way to produce amazing content is to create a resource that can be expanded daily, weekly or monthly. If you are in the finance industry why not update interest rates or the stock market on a single blog post that you can update. Over the course of a year this blog post will likely be the resource people use to get their daily or weekly interest rates. Remember to try and make it easy for the user. If you post a brand new blog post every day that simply states current interest rates or the level of the S&P 500 they will have to “find it” over and over again. If this is updated on one resource they will be able to bookmark it and go back to the bookmark to get the updates. Also, you will want to check out the How to Get Business From Yelp resource as this is something that will help owners get more customers in the door or on the phone. It is shocking to me how difficult some websites are to navigate. With every Google Panda, Penguin and Hummingbird update the company states that the user experience is the most important to search engines. If the user is not happy with their experience they will bounce quicker and the time on site will be shorter. This is a sure fire way for Google to determine that the content you have produced is not useful. If you have a 10,000 word document illustrating mortgage rates over the course of the last year it is highly unlikely someone is going to bounce quickly or not spend, at least, a few minutes on your website. Coming up with creative and unique content can be difficult to do so it might be worth it to hire someone that can help with this process. I have worked with many clients that have used the article marketing and press release tactic in an attempt to get links and, ultimately, traffic. I have always been concerned about this type of marketing campaign. The biggest issues I have is that most businesses want to use the same article all over the web. They will pay $100 to submit an article to PRWeb or PRNewswire. This will be the exact same article they just published to their business website blog. They will then share it on Article Factory, EZine Articles and Amazines. Mind you, this article has anchor text links for money keywords. Most of these companies may think they will be able to get away with this but the Google algorithm is way too comprehensive and smart not to figure out that the same article is being submitted across multiple websites on the Internet. Obviously, this could happen once or twice for a very popular article but it doesn’t happen by chance for every single article or blog post that goes up on a business website. For more on a site that is unlikely to get hit by any type of change in the near future use our Flipboard SEO and Traffic resource. With the Panda 4.0 update we saw most press release websites take a major hit. Some lost over 75% of their search traffic. The fact that most of the press releases and articles are not original content makes it very difficult for search engines to continue to rank this content near the top of the first page. The press release websites cannot argue because they have not stopped businesses and individuals from posting duplicate content. They simply wanted the $50 or $100 for the press release and there were no restrictions. There might have been editors that looked over each press release but they definitely did not do the research to see if this content was on other websites on the Internet. From first hand experience, I know several businesses that publish a blog post and then spend $150 for the same blog post to be copied and pasted to multiple press release websites. This is not good for the user and search engines do not like it. There is nothing wrong with writing a press release for an event that is coming up or to gain a little bit of exposure but simply copying and pasting content across the web is not the proper way to do SEO. If you are struggling to understand the best ways to do SEO to help your website rank in Google search please feel free to reach out to me at jwojdylo@gmail.com and I will be more than happy to offer consulting options. I also have several packages that will assist you with your on site SEO as well as getting natural links directing to your business website which is exactly what Google and other search engines love. Before deciding on social bookmarking websites or article marketing opportunities always ask yourself who else has access to these resources. If they are free or low cost I would steer away. As a professional in your industry you should know what websites require you to prove your area of expertise. It may be a bar number if you are in the legal industry or a medical number if you are in the field of medicine or orthodontics. Reaching out and submitting unique and valuable to these types of websites is much smarter than just copying an article from your website to an article directory or a press release website. These are things you must consider when moving forward with your online marketing campaign. Unfortunately, many professionals do not realize this and they could end up ruining their website before it even gets off the ground. Google understands what industries make money. The do cash the register with high paying keywords on Google Adwords if you remember correctly. They are fully aware that law firms are willing to pay $50 for keyword phrases related to a DUI attorney. They also know plastic surgeons will pay $40 for breast augmentation keywords. LASIK eye surgeons and orthodontists are willing to shell out $30 to $35 for a click from searchers looking for eye or mouth corrections. One customer or client for them is worth big bucks. For more on this please use the Personal Injury Lawyer SEO article. The fact that these are such competitive industries means some SEO agencies and companies will incorporate unique practices in hopes of getting a client or business to the front of Google search. Unfortunately, many times these tactics are not pleasing to the end user. If the website visitor is not the most important to the business website there is a strong likelihood the website will not rank very well in Google search or on any search engine website. re-read it. Powerful stuff. People become blinded to the possibilities their niche has to offer. By not providing a broad spectrum of relevant info, that is not directly targeted, both reach and rankings will be limited.